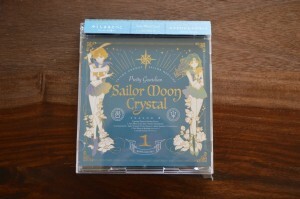 The first of three Sailor Moon Crystal season III theme song CDs was released on April 27th in Japan. I ordered mine from Amazon Japan so I was lucky enough to get it by Thursday the 28th. 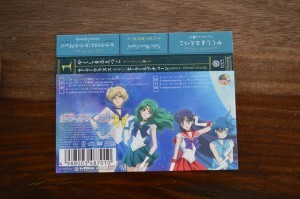 This CD single costs 1365 yen, about $13 US, and contains two tracks and a bonus DVD. 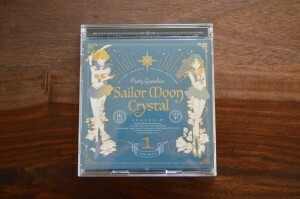 The songs included are the current opening and ending themes for Sailor Moon Crystal’s Infinity arc. If you’re looking to check out the full length versions of these songs you should support the official release and buy the CD though you should be able to find these tracks somewhere on the internet. 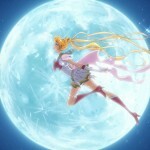 The opening theme, In Love With the New Moon, is sung by Etsuko Yakushimaru. She previously covered Otome No Policy in the 20th Anniversary Album. 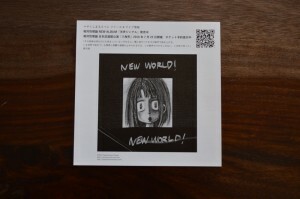 Included with the CD is an ad for Etsuko Yakushimaru’s rock band Sōtaisei Riron’s latest album New World which was released on the same day. This is my favourite of the two tracks on this short single. A karaoke version is also included if that’s something you’re interested in. 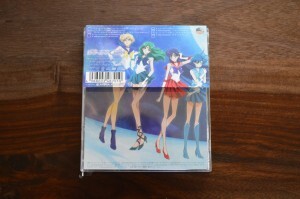 The ending theme, Eternal Eternity, is sung by the voices of Sailor Uranus and Sailor Neptune, Junko Minagawa and Sayaka Ohara. This song embodies the Infinity arc as it is sung by these characters. 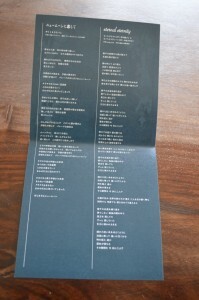 Four music videos are included on the DVD. The TV sized opening and closing are pretty much what we’ve seen on TV and in the streaming show, but with lower resolution. 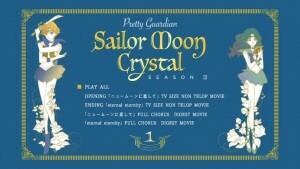 The longer album length music videos included clips from Sailor Moon Crystal’s Infinity arc. There appears to have been some attention put into what clips would be included as they have footage up to and including Act 29, which was the latest episode to air prior to this CD’s release, but nothing further as far as I noticed. 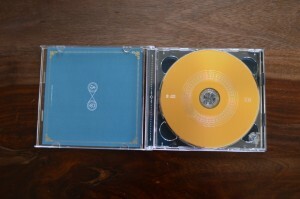 Two more CDs will be released at one month intervals. 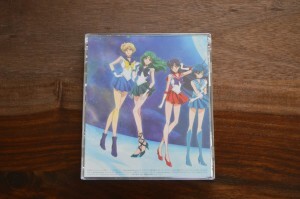 A second CD with the same opening In Love With the New Moon, but sung by Mitsuko Horie, the voice of Sailor Galaxia from the original Sailor Moon anime, and the second ending, Maiden’s Advice, sung by Misato Fukuen, the voice of Chibiusa will be released on May 25th. 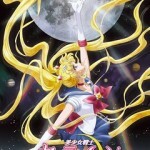 A third CD single with the opening In Love With the New Moon but this time sung by Momoiro Clover Z and the third ending theme, Only Eternity Brings the Two Together, sung by Kenji Nojima, the voice of Tuxedo Mask, will be released on June 22nd. 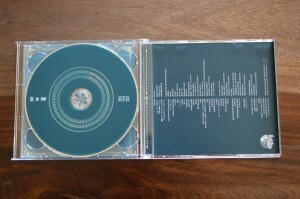 Keep reading for more images of this CD’s packaging. No screenshots are included since they’re all from scenes we’re already seen before. 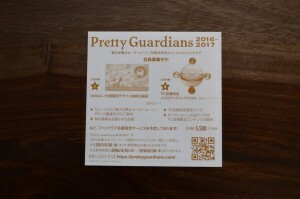 This entry was posted in Pretty Guardian Sailor Moon Crystal (2014) and tagged Eternal Eternity, Etsuko Yakushimaru, In Love With the New Moon, Junko Minagawa, Music, Sayaka Ohara by Adam. Bookmark the permalink. Ah, I was hoping it would include the karaoke versions they put up on Youtube as well! The art is so pretty! I can’t wait to see the full image the pictures create! 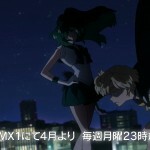 I think tomorrow we get to see the new ending…will the op also be sung by the Galaxia actress in show? I know someone had posted previously we will be getting three different openings as well as endings. I got hyped and thought it was the entire soundtrack which I’m dying to hear! Is there a release date for that? I don’t know what you think about this, but I consider the soundtrack of the 90s anime is unbeateble, unforgettable and unique. I still listening to, frequently, the whole OST and makes me some kind of magic feeling… those memories are forever with that music. But now… I can’t remember any theme of the OST or the BGM from the current series. Well, the opening and the ending theme songs, and also the eyecatch, but the rest.. nothing!… Will I be just me who thinks that? Yes, while the original is unique and iconic, you’re still crazy for saying that Crystal does not have memorable songs. Happy you bought it! Glad you seem to enjoy it! I have not been a fan of the songs so far. 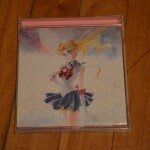 The first version of the season 3 opening which is on this cd is meh. I’m sure she is a great singer/artist, but the full version of the song is not as appealing as the tv size version. The music and vocals are lacking. I actually enjoyed the ending theme though.